You may recall I cast on a particularly hideous neon coloured aran-weight yarn during the power-cut on Christmas Eve - it's amazing how much nicer it looked in the darkness. Keen to use it up as quickly as possible, I used the largest needles I have and the yarn held-double. 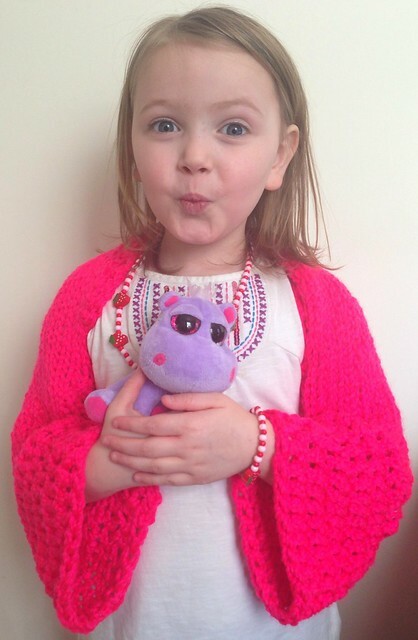 The result was this hybrid knit and crochet shrug, which has gone down a storm with Little Miss - she often wears it for dressing-up and she'd wear it out, if I'd let her. My iPhone camera really struggled to capture the colour, but hopefully you can see it well enough without sunglasses. It's actually rather nice - apart from the squeaky acrylic yarn and the colour. I'll definitely be making more for LM, and myself too. Whenever I post something like this, someone asks for a pattern. As it happens, I made it up as I was going along but if you want to make one, here's the recipe. It's worked from side to side starting with the knit section which is sewn up before adding the crochet. Yarn of any weight - I used 2 x 100g balls of Aran yarn held-double, to fit age 5 - 8yrs (approx). Appropriate needles for the yarn - mine were 12mm, used to knit flat. Crochet hook appropriate for the yarn - I used 10mm. I probably shouldn't say this, but if you're reckless like me, you can make an educated guess about how many stitches to cast on, making sure you err on the side of caution. I used 30 sts and ended up with wide sleeves and a back which is a great length for Little Miss. 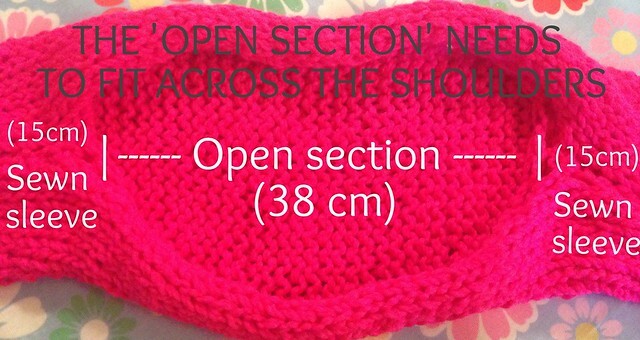 Cast on the number of stitches you need, according to your chosen method above. Work in stocking stitch until the piece measures the same as D (mine is 68 cm), then bind off very loosely. Fold lengthways and using mattress stitch, form the "sleeves" by sewing from each end, leaving the central section open so that it will fit across the shoulders (measurements for LM's are below). Using (UK) treble crochet stitch, work around the bottom of one sleeve. Repeat for five more rounds, or until the sleeve reaches the desired length. Do exactly the same with the second sleeve. Crochet one round of treble crochet around the 'open section'. Sew in ends. You're done! I think this would look great with a second yarn for the crochet, and also in a lightweight yarn for summer. There are lots of variations you could try. If you do, please let me know how you get on. You can find links to several other 'recipes' and some proper patterns on this page. Happy knitting! 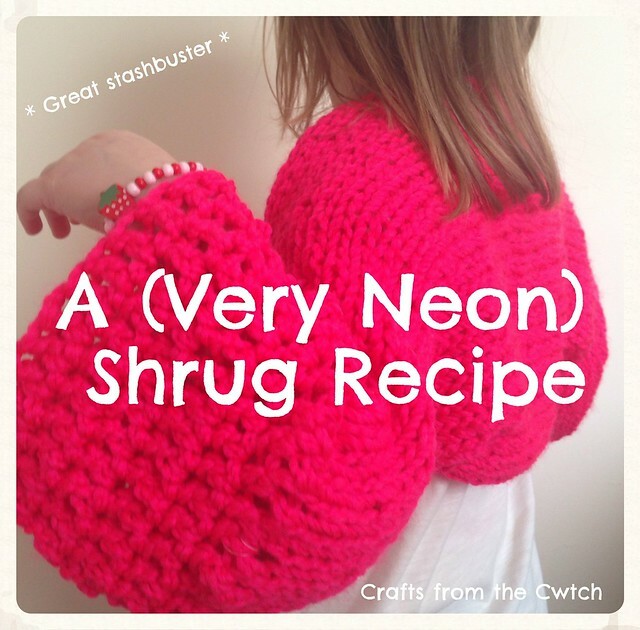 Little Miss looks amazing in her very very pink neon shrug. I think you have to be a certain age to pull off that colour. I am so impressed with you creating your own patterns. Have to tell you I am so excited to see the Great British Sewing Bee tomorrow night (do you mind if I give your Mum and your blog a mention over on mine).